Range of UV curing GRP (Glass Reinforced Plastic) based on vinyl ester and polyester resins, formulated for protection against corrosion, abrasion, impact, chemical attack, aggressive climatic environments, etc. Corrosol PE IP - Sheet laminate used as a non-metalic cladding insulation protection for cryogenic and thermal applications and for mitigation of CUI (Corrosion Under Insulation). Corrosol VE GP - Sheet laminate. Typically used in protection of chemical storage tanks, oil storage tanks, bund walls, chemical spillage areas, above and below ground pipelines, roofs, splash zones and riser, etc. Corrosol Primecoat - One component vinyl ester resin used as a primer prior to application of Corrosol Laminates. Corrosol Sealcoat - One component vinyl ester resin for coating of laminates if additional protection is needed or as a stand alone corrosion protection system. Product solutions for civil, infrastructure, industrial and commercial products, including roads, sewerage and drainage projects, desalination plants, power plants, bridges, tunnels, underpasses, railways, airport runways and airport construction, defense (aircraft) hangars, pipeline projects, townships, oil fields, marine structures, amongst others. Full range of manufactured products which includes various types of plasters and renders, block laying mortars, block filling grouts, repair mortars, theming mortars and EIFS (Exterior Insulation and Finish Systems mortars). Corrotech Construction Chemical manufactures range of own concrete admixtures under the brand name Corromix. Range of repair composite materials and industrial protective coatings by UK based international manufacturer Belzona Polymerics. Metz Acid Proofing Solutions encompasses a range of products that is targeted towards protection of concrete and steel from severe chemical attack. This range of products provides protection from acids and alkalis in the range of PH 1 to 14. Typical areas for protection include primary and secondary containment areas, pits, trenches, sumps, sulphur pits, acid plants, fertilizer plants, refineries, food and beverage plants etc. Acid Brick & Tile Systems Metz Acid Bricks & Tiles are acid resistant, heavy duty ceramic tiles manufactured to provide chemical and wear resistant floors and linings for chemical, food & beverage plants in conjunction with Metz acid resistant fixing materials. Chemical Resistant Coatings & Linings Metz chemical resistant resinous coatings are used in corrosive environments where our clients wish to prevent attack of generally steel and concrete by extremely strong chemicals. Coatings are economical, highly resistant layers usually of 100–300 microns per coat. Linings & Toppings Acid resistant linings and toppings are heavier-duty systems then coatings. Linings are approx. 1–2 mm thick systems, toppings are normally 2–8 mm in thickness. 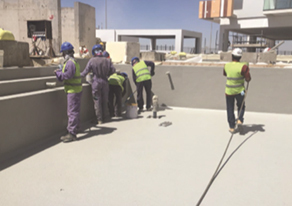 Linings and toppings are more suitable than thinner coatings for repair of acid attacked concrete, for example when there is the need to fill areas removed by highly corrosive chemicals. These materials can be either poured, sprayed or trowelled into place. Acid Proof Concretes Metz manufacture a range of acid proof concretes and mortars to resist the strongest chemicals in extremely demanding physical environments. Materials can be used as protective toppings, grout and mortars, or as concretes that require no further protective layers after placement. Heavy/Medium Duty Toppings Metz medium/heavy duty toppings range from 2 to 5 mm in thickness and are available in degrees of surface texture to provide a slip resistant finish suitable for most applications. Range of manufactured product for coating and lining of gas, water and Jet A1 pipelines and tanks. Abrasion and corrosion protection of buried gas pipeline.